NOTE: This information is good as of 7/24/2015 and is subject to change! Your organization may be taking advantage of the Power BI Free offering, but it may be hard for you to tell exactly how many have signed up. 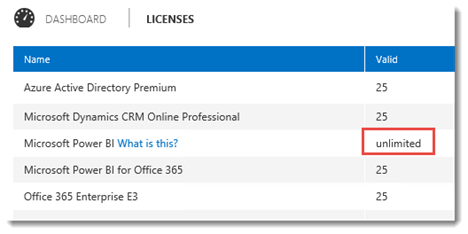 Most of the dialogs within Office 365 will just show unlimited. I wanted to show you how you could actually get the number. There are two approaches that I’m aware of currently. Within the Bulk Assign Dialog, on the license screen, this will not show unlimited for Microsoft Power BI. I think this was an oversight, so it is possible this will change in the future. 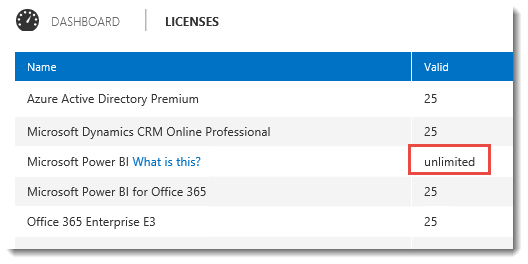 This can be done within the Office 365 Admin Center. Here we can see that we have 9 licenses assigned. The other option is to use PowerShell. We actually want to get the Azure Active Directory PowerShell Cmdlets. This includes items for Office 365. The first two sections show how to install it, and connect to AAD. After that, we want to run the following Cmdlet. This will list the Skus that are part of your Tenant. For the Power BI Free offering, we are interested in POWER_BI_STANDARD. Here we can see that ConsumedUnits shows 9.